How Do I Return Unclaimed Paychecks to the State? You have probably heard the phrase, "Ignorance of the law is no excuse." Well, this is one of those cases that illustrates the rule: you cannot keep un-cashed employee paychecks; you must turn them over to your state. Unclaimed paychecks are a special kind of unclaimed property. If you are sitting on unclaimed paychecks, you (the employer) are legally bound by state law to return any un-cashed paychecks to the state where the person last worked. 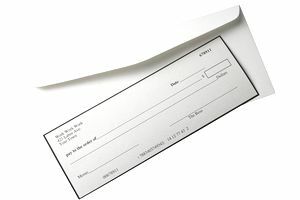 You can be fined or penalized if you don't return the check, even if the person can't be found. Why Must Unclaimed Paychecks Be Turned Over to the State? The principle behind this law is called "escheat" (it's pronounced like it looks, in two syllables: es-cheat.) Escheat means "surrender," and it is based on a common law doctrine that requires unclaimed property be returned (surrendered) to the state, not kept by the person who has it. What Are the Rules for Returning Employee Paychecks? Escheat laws vary by state, but most have a requirement that the company issuing the paycheck must make an effort to find the ex-employee and turn over the paycheck(s) amount within a certain amount of time (a one-year limit from the time the paycheck was issued is common). How Do I Notify the Ex-Employee? First, send a certified letter to the person's last known address (that's why you keep good payroll records, right?). The time between notification and filing varies by state, but it's usually no longer than 180 days (approximately 6 months). That is, you must notify the person then wait no longer than the specified time before turning over the paycheck to the state. Sending a certified letter means that you have a record if the letter is undeliverable; this will help you show the state you did your due diligence in trying to find the ex-employee. How Do I Submit Un-Cashed Paychecks? Each state has a different requirement. In Iowa, for example, you must try to locate ex-employees from July through September and send in your report no later than November 1. How Do I Find Out the Escheat Laws for My State? Begin by doing a search on "escheat" and your state name. Or you can look on the website of your state treasurer, department of revenue, or tax agency to find information. Bizfilings has a list of unclaimed property laws by state. Remember, each state has different requirements. Set a "to do" note on your payroll calendar for the end of each year and run a report that shows the information for each paycheck. Tag the paychecks that have not been cashed. Then, send out the certified letters. Finally, follow your state's requirements for returning unclaimed paychecks for those ex-employees who haven't cashed checks. If an Auditor Comes to Your Business —Are You Ready?